Edward Bateman is once again a finalist in a major global competition. The edgy digital artist and University of Utah professor jets to Cardiff, England, on Sunday for an exhibition and talk for the important Lumen Prize (www.lumenprize.com), one of 25 people chosen from about 700 submissions. Better yet: a picture of his work was selected for the invitation. The winners will be announced October 8. London’s “The Guardian” Culture Blog calls this “The World’s Pre-eminent Digital Art Prize.” Artists compete for prize money totaling about $7,000, a place in the Lumen Online Gallery and the Lumen Prize Exhibition which tours internationally from October 2014 to March 2015. 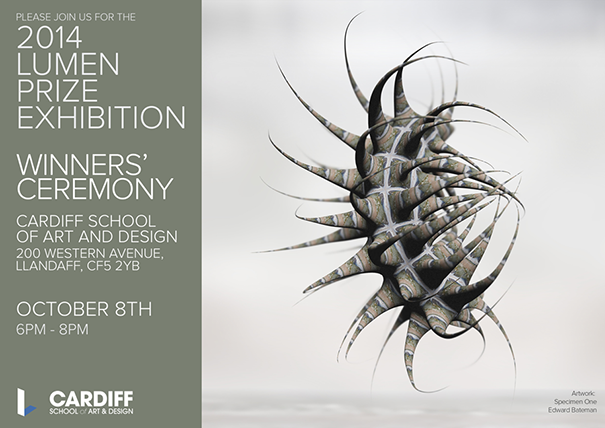 It will open at Llandaff Cathedral, Cardiff, on October 7, before moving to the new Cardiff School of Art and Design for the winner’s ceremony. Then it will be installed in the Onassis Cultural Centre in Athens, Greece, followed by a show at the Auditorium on Broadway in New York City December 2-5 as well as venues in Amsterdam and London. The exhibition is installed on large-scale screens, PCs, and high-definition projectors at all of its venues. Many works are also shown in print form or as interactive displays. Shows are accompanied by symposia, seminars and similar educational outreach. If you can make it, there is a panel discussion December 3 at the School of Visual Arts, New York City. Bateman received the Salt Lake City Mayor’s Award in 2008 for his contributions to the arts, is the author of the 2009 book of his images, Mechanical Brides of the Uncanny, and has participated in exhibitions in the UK, Germany, Poland, Hong Kong, Belgium, China, Finland, Lithuania, Canada, New Zealand and various locations throughout the United States. (And as a matter of pride, and full disclosure, he’s a member of the Artists of Utah Board of Directors). The Lumen Prize is a not-for-profit competition and tour that “celebrates the very best art created digitally.” The website states that the goal is to focus the world’s attention “on this exciting genre” through the selection of works submitted by artists worldwide and chosen by an eminent and international panel of judges.